Despite being a bit dubious about it, I picked up Angelfire last spring on the recommendation of Allison at The Allure of Books. Plus, I had the opportunity to attend a Dark Days of Winter tour stop where Courtney was signing. Guys, Angelfire. Was. AWESOME. It included awesome fight scenes and a little bit of romance. Suffice it to say, I am eager to see where Ellie's story goes next. 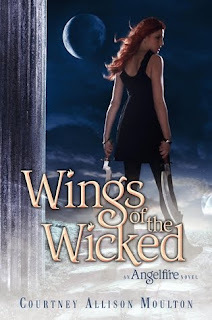 I cannot wait for this one - I adored Angelfire so much.